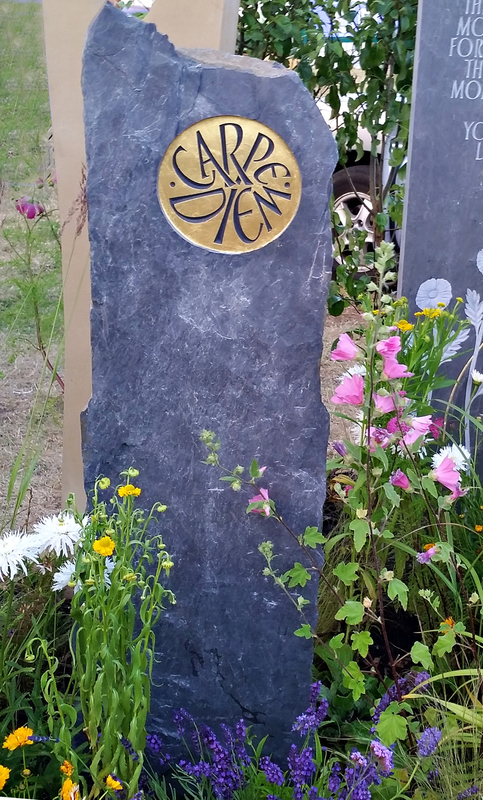 This hand carved Welsh riven slate standing stone was first exhibited at Chelsea Flower Show 2014. Alan Titchmarsh saw it and fell in love. The hand carved Welsh riven slate standing stone now takes pride of place in Alan Titchmarsh’s private garden. Martin Cook exhibits all pieces of hand carved and individually designed standing stones, sundials, benches and tables at Chelsea Flower Show and Hampton Court Flower Show each year. This year Martin Cook’s hand carved standing stones, sundials, benches and tables can be seen at Grand Designs Live 2015 at Excel in May. Martin’s work has appeared in TVs Grand Designs in the ground of a house in Shiplake. Martin supplied a hand carved Cumbrian slate standing stone for the show.